Fun Birthday Party Ideas for a Bubbles themed party! 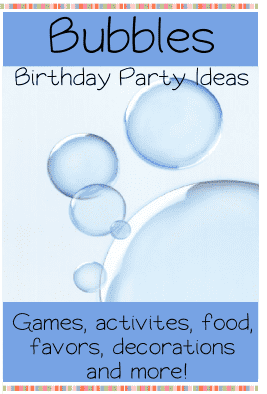 Great birthday party ideas with a Bubbles theme ... just pick and choose which ideas you want to use for your Bubbles party. Use our easy homemade bubble recipes to make lots of bubbles for your party. Great recipes for colorful, HUGE, easy and inexpensive bubbles. Bubbles - take off label and replace with a large mailing label printed with a thank you note from the birthday child. Round blue or white cards - write the party information on the inside. Buy small blue or white plastic balls and write the party information on the balls with a permanent marker. Buy small individual bottles of bubbles and pour out the bubble solution (retain for later use at the party). Dry the bottles. Print out party information (4 invitations per page) and cut out. Roll the invitations into a scroll and place through the bubble wand hole. Replace the bubble wand and send to party guests. Buy bottles of bubbles and remove the outside labels. On large address labels print out party information and stick to the outside of the bubble bottles. Just for fun enclose a small sheet of bubble wrap inside the invitation. On the walkway to the party tape down sheets of bubble wrap for guests to walk on. Hang different sizes of white Styrofoam balls and / or rubber ducks from the trees with fishing line. Set up a bubble machine right outside the party entrance to welcome the guests to the party. Cover the doorway to the party with bubble wrap. Decorate with blue, white and clear balloons. For a fun effect you can tape different sizes of paper plates in white and blues to the walls to look like bubbles. Place glass or clear plastic vases filled with blue, white and clear marbles on the party tables. Or fill different sizes of clear containers with bubble gum balls or round candies. Use empty bubble bottles for a centerpiece by hot gluing them together. Have an adult mix several colors of water based paint in different containers of bubble mixture. Give each guest a piece of thick art paper or a painters canvas. While the adult blows bubbles with the paint mixture the party guests can catch them on their paper. When the bubbles pop on the paper they make fun designs. Variation: Buy white t-shirts for the guests and let them change into them before the bubble art. Instead of paper or canvas let the kids catch the bubbles on their shirts. Let the paint dry and spray with a fabric paint sealer before letting the kids take them home as party favors. Fill a small kids pool full of bubble solution . Set out lots of different types of wands for the kids to make bubbles with such as bubble wands, wire hangers bent in a circle, small hula hoops, etc. Let the kids experiment with different sizes and shapes of bubble wands. Have several adults of older children (or better yet a few bubble machines!) blow bubbles for the kids to pop. Let them pop them with their hands or give them different items to pop them with such as squirt guns or pool noodles. Fill a small kids pool with bubble solution at least 3" deep. Place a large hula hoop inside the pool. Inside the hula hoop place a step stool or sturdy item like a cement block for one child to stand on. Help the kids one by one to stand in the middle of the pool on the step stool. Have them bend down and pick up the hula hoop and slowly lift it over their head. The hula hoop will make a huge bubble that will enclose the child. Have a camera ready to take their picture! See our big list of fun activities and games to play with bubbles and birthday party games for kids of all ages. Cut out food with circle cookie cutters such as Rice Krispie treats, brownies, sandwiches or fruit. These cute bubble cupcakes are made by spreading blue icing onto a cupcake and then placing round balls made from fondant on top. 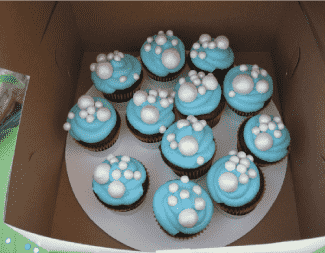 The key is to use different sizes of "bubbles" and make the placement random on top of the cupcakes. These would look great stacked on a cupcake tower or on the party table. Wrap up party favors in a blue and white bandana and tie with a ribbon. Wrap up party favors in bubble wrap and tie with a blue ribbon.